Vipers were held to a 1-1 draw away to Tooro United on Tuesday in the StarTimes Uganda Premier League. The defending champions who lost 3-1 at home to SC Villa on Saturday have now gone two games minus victory. After a first start by the home side, they took the lead thanks to a Godfrey Lwesibawa free-kick from just outside the area. Vipers would soon be level before halftime with Hamis Diego Kizza scoring his first goal since joining the Venoms last month. Tooro who looked frustrated for conceding with only 7 minutes to the break, had Allan Kayiwa and Musa Mukasa both booked for descent on 42 minutes. Ij the second half, both sides pressed for a winner but custodians at either end were equal to the task as they held on for the two to draw 1-1 in the end. Vipers are now on 38 points, three behind leaders KCCA FC who take on Bul FC at Lugogo on Wednesday afternoon. 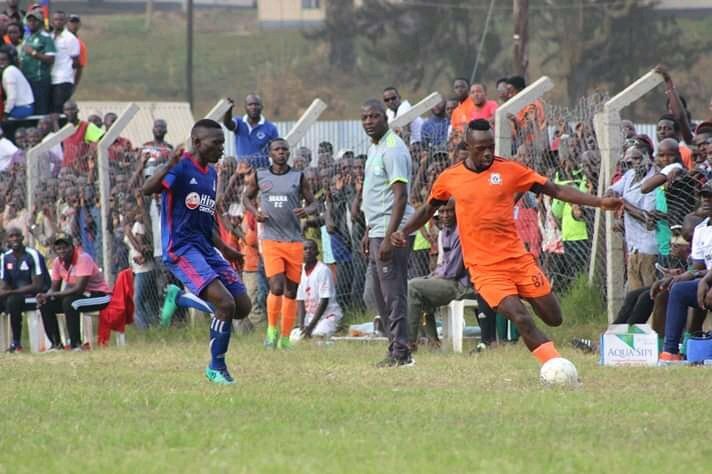 For Tooro who have not lost a single game since moving to Buhinga, they also remain 6th on the standings having gathered 28 points from their first 19 games. At the Green Light Stadium in Arua, Onduparaka continued their unwanted winless run with a 0-0 draw against URA FC. Onduparaka went into the game winless in their last 6 League games and struggled to create decent chances. At the other end, the visitors looked like they had come to play for a draw as they were happy to sit back on multiple occasions. After a clean but barren first half, both sides had two players booked in the second with Faizul Ibrahim and Rashid Okocha flashed for the home sides, Patrick Mbowa and Ronald Kigongo on the visitors side. Onduparaka who last won a game on 16th December moved up to 7th on the log with 27 points while URA remained 5th with 29 points from 19 games. At Mwerere, inform Mbarara City were also held to a goalless draw away to Bright Stars. The Ankole Lions who always tend to struggle on the road, found it difficult against a properly organized Star’s side and their frustration was compounded by two yellows shown to Rashid Muhammad and Jude Semugabi. For Bright Stars, they looked to be the better side over 90 minutes but failed to find the all elusive winning goal. The draw means that Fred Kajoba’s side have now gone 10 League games minus victory and remain 9th with 24 points. For Mbarara, they are still third on the standings with 36 points from 19 games. Elsewhere, there was a rare victory for Ndejje University who defeated Maroons 1-0 at the Luzira Prison’s Grounds. Richardson Asaba was the hero for Raymond Komakech’s side, scoring the winner 10 minutes to the break. In a nerve racking game for Ndejje, they received three yellow cards on the day as Isaac Kisujju, goalkeeper Derrick Emukule and Robert Esenu were all booked in the process. Maroons who were coming off a 1-0 win away to URA failed to get going from the first minutes with their only notable statistic being the yellow card flashed to Belmos Opio on 75 minutes. Defeat for Maroons leaves them sitted in 13th spot with 18 points from 19 games. For Ndejje who registered a first win since beating Paidha Black Angels on 30th of October, they climb into 14th with 13 points, 5 adrift of safety. In the other game played on Tuesday, Joel Madondo scored the only goal of the game as Kirinya JSS overcame Police FC 1-0 at the Mighty Arena in Jinja. Madondo who has now scored 10 goals this season, found the back of the net, 5 minutes to the break as his side held on to a first victory in 8 competitive games. The victory elevates Kirinya into 10th on the standings with 24 points while Police drop to 8th, having accumulated 27 points from 19 games.